Stop power tool theft case study. Our Team of retail display professionals can help your business find the right product display solution. 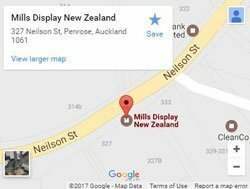 Call us or visit our showroom at 327A Neilson Street, Penrose in Auckland. One of our Hardware customers contacted us with a problem around theft of their Power tools. We discussed with our customer what the issue was and provided one of our many security products to help. This particular product is attached to a surface with a strong adhesive tape and then the cable is locked around the product. These are easily installed and are very simple to use, especially suitable for items that have a wrist strap. If the alarm is triggered by mistake there is a remote that can be used to turn it off. Our customer said this sounded like a good option and they were willing to trial it. Our customer trailed the Recoiler on one of their Power tools and it worked as an effective deterrent. As there was minimal install time they viewed it as an efficient way to secure the product without wasting staff time. They particularly liked the option of having the remote to be able to turn the alarm off without having to walk all the way over to the product. Our customer is now going to continue the trial a little longer with a view to rolling the product out to all stores in the near future.